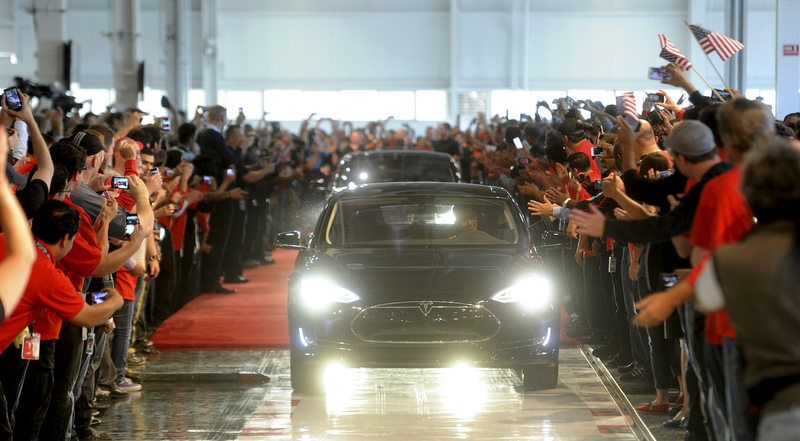 Tesla’s risky vision for the car of the future is putting Detroit to shame. The Silicon Valley-based electric carmaker run by Elon Musk is racking up some prestigious awards for its new sedan. On Monday, Motor Trend became the third respected industry publication to bestow the Model S with a 2013 Car of the Year gong. That’s better than Motown, European or Japanese manufacturers managed. Several of Tesla’s giant competitors have made decent forays into electric vehicles, whether hybrid or fully battery-powered. But the Model S is in a different class. The sleek new sedan has space for up to seven. It’s fast, with some versions speeding from zero to 60 miles an hour in about four seconds. It’s full of the latest gadgets, from a 17-inch touch-screen control panel to automatically retracting door handles. And it can travel as far as 300 miles on one charge, and be ready to go again after 30 minutes plugged into a high-power charging station. These are the kinds of results most in the car industry establishment had long dismissed as impossible to achieve – a point made several times at a New York event on Monday by an ebullient George Blankenship, a former Gap and Apple retail executive who is now Tesla’s head of sales and ownership. Musk started Tesla with grand ambitions to compete initially at the high end of the market, something the company’s awards suggest he has nailed. The 41-year-old is used to going out on a limb, having quit graduate school to set up PayPal before founding Tesla – and rocket and spacecraft manufacturer SpaceX. Bosses at bigger carmakers may feel encumbered with a more incremental, lower-risk approach. The $3.6 billion Tesla has also had to deal with crises from cash squeezes to a year-long halt to production to the death of three top employees in a plane crash – not to mention funding hefty research and development outlays with positive free cash flow still only expected toward the end of this year at the earliest. Musk’s next challenge is to turn a low-volume showstopper into a consistently profitable business. It’s a tough road. At almost $50,000 for the most basic model, the Model S is unlikely to tempt the masses away from increasingly fuel-efficient gasoline chuggers available for half the price. But given Tesla’s success so far, larger rivals should be paying close attention. On Nov. 12 Motor Trend magazine announced that it had named Tesla’s Model S sedan its 2013 car of the year. Earlier this month the Model S was named Automobile Magazine’s 2013 Automobile of the Year and picked up Yahoo Autos 2013 Car of the Year award at the end of October.